THE Mayor of London, Boris Johnson, has shown former Governor of California Arnold Schwarzenegger London's newest river crossing. 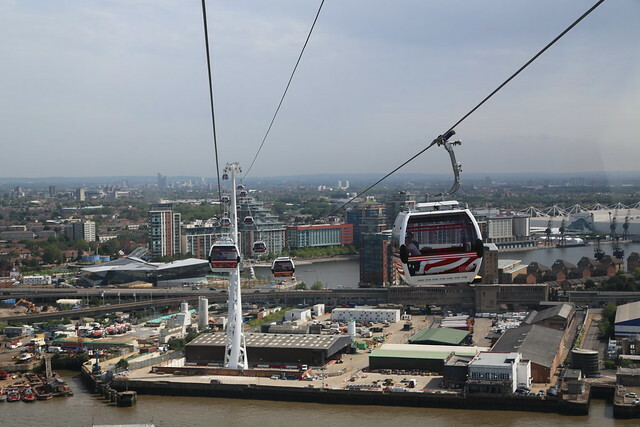 The pair took to the skies on the Emirates Air Line cable car after first watching the USA's Basketball team take Gold in the Basketball final at the North Greenwich Arena, as the Dome has been renamed for the duration of London 2012. Mayor of London Boris Johnson said: “When Arnold said he would be back this summer, I had absolutely no reason to doubt him. Last year we took in the views around City Hall on two wheels, this year we’ve seen the entire skyline from what is without doubt a feat of Austro-British engineering." Austrian firm Doppelmayr was one of the companies that helped to construct London's newest river crossing. The visit by Schwarzenegger, who features in new movie The Expendables 2, and the mayor of London came a day after the cable car recorded its busiest day since opening with 31,964 journeys. 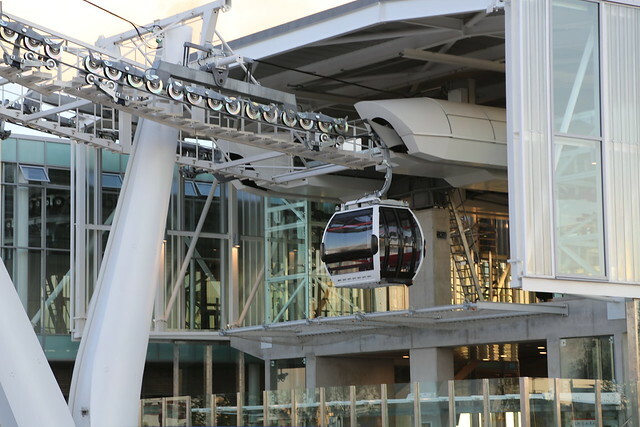 The £60 million cable car, which links North Greenwich with the Royal Docks,opened to the public in June. THE NEW cable car across the Thames opened to the public at midday today. The Emirates Air Line takes passengers almost 300 ft into the air and across the river to the Royal Docks in about five minutes. The price of a single trip was confirmed last week as being £3.20 when using a pay-as-you-go Oyster card and £4.30 for a cash fare. Mayor of London Boris Johnson was in Greenwich for the official opening of the river crossing that he announced less than two years ago and which gained planning permission in January 2011. 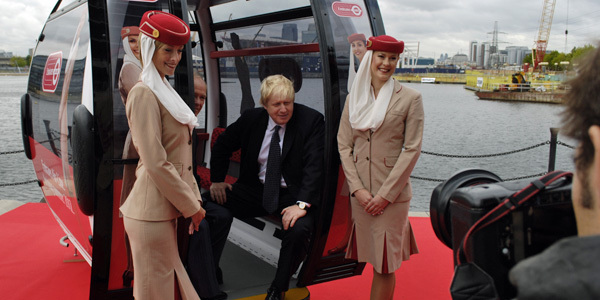 The £60 million cable car has been sponsored by airline Emirates in a 10-year deal worth £36 million. Transport for London (TFL) said when the scheme was announced that they were aiming to "fund the scheme's construction entirely from private finance." 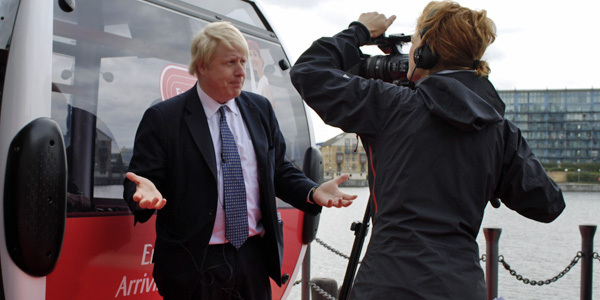 London mayor, Boris Johnson, told the News Shopper today that the shortfall in the development costs would be made back by "revenue, retail and merchandising." First in the queue to use the cable car when it opened at noon were Trudy and Bob Lawrence from Roan Street. Trudy said: "It's an exciting and innovative way of crossing the river and I do like that you can take a bicycle across." Bob added, "I'm an engineer and I think it's a great engineering feat and it's nice that we can do things like this in a city like London." 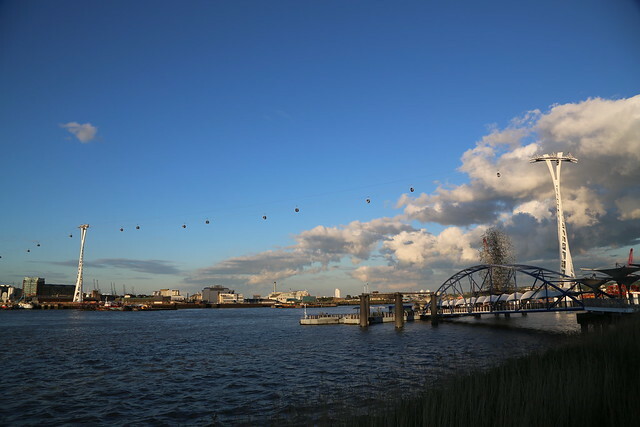 "The Emirates Air Line is a stunning addition to London's transport network, providing a much needed new connection across the Thames. I am sure the Emirates Air Line is now set to be a must-see destination in its own right, giving people the chance to drink in breath-taking panoramic views. 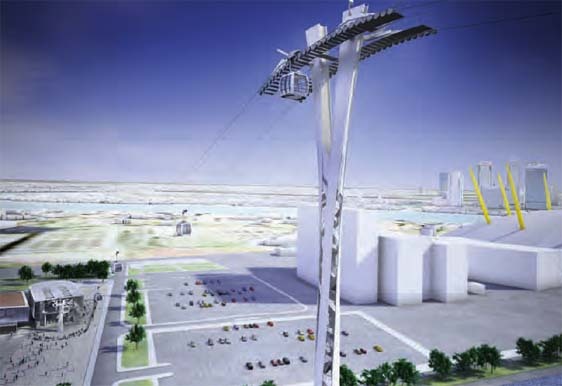 "Crucially, the Emirates Air Line supports my ambitious plans to revive the neighbouring areas, which have been neglected for decades, creating jobs for Londoners and stimulating growth." It's welcome news that the cable car has been completed in time for the Olympics, and it provides another way for visitors - and Londoners - to get to Greenwich. However, it is no substitute for the river crossings we need to build out economy including the Silver town tunnel to the Peninsula and Crossrail." I welcome the opening of the cable car. I was impressed by the ride – the views are spectacular. However, although this will undoubtedly help attract tourists and visitors to the Greenwich Peninsula, it is no substitute for the long-overdue new Thames crossing. Until we get a new tunnel between the Greenwich Peninsula and Silvertown, and a new bridge between Becton and Thamesmead, we will continue to suffer from inadequate river crossings and the consequent congestion at Blackwall”. "The cable car has the potential to become a serious tourist attraction which will draw even more visitors to this part of London in the long-term. 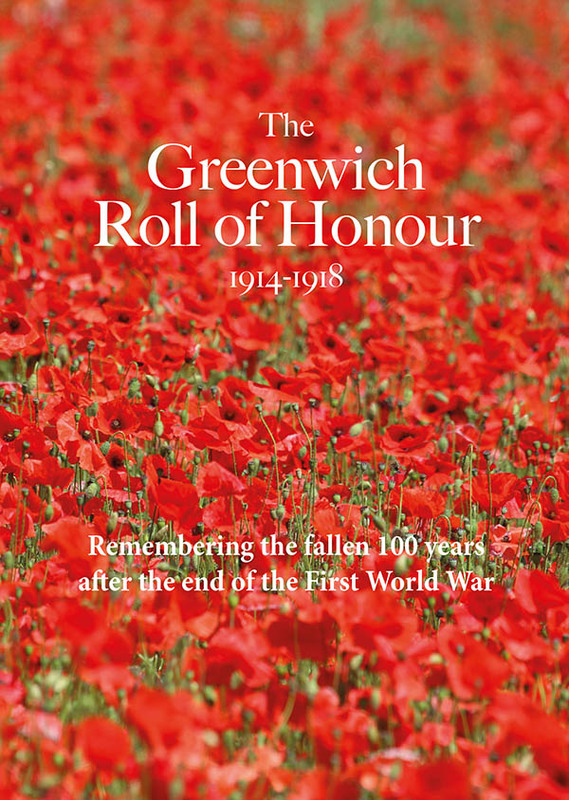 The Mayor of London has once again made a serious investment which will benefit the people of Greenwich, despite the grumbling of senior Labour Councillors at the meeting this week." 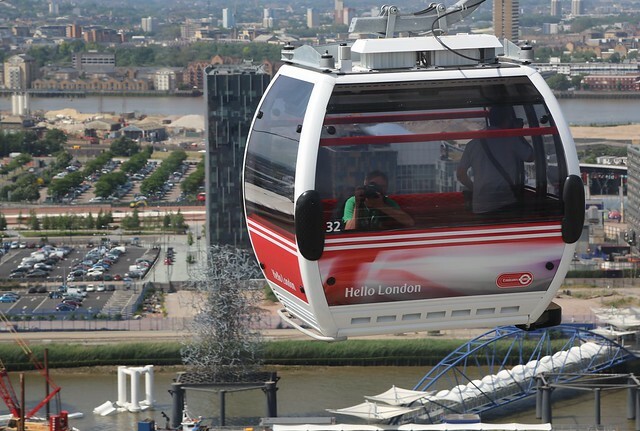 “This cable car is exactly the sort of river crossing London needs. But plans to build new Thames road tunnels or bridges in east London must be scrapped – this would create more traffic, more congestion and more air pollution." 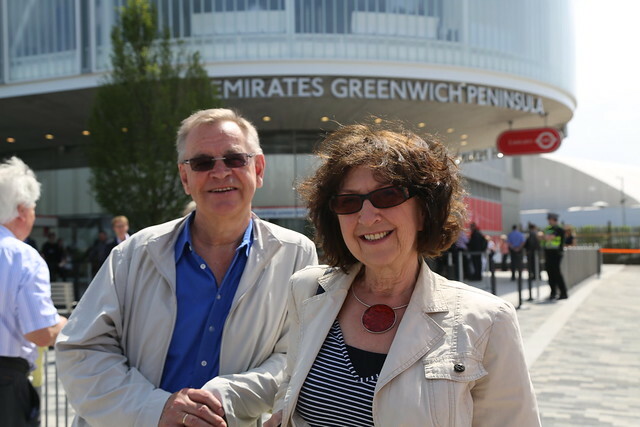 "We have been following the progress of the Emirates Airline closely throughout the construction period and are delighted that the service has opened in time for The Olympics. 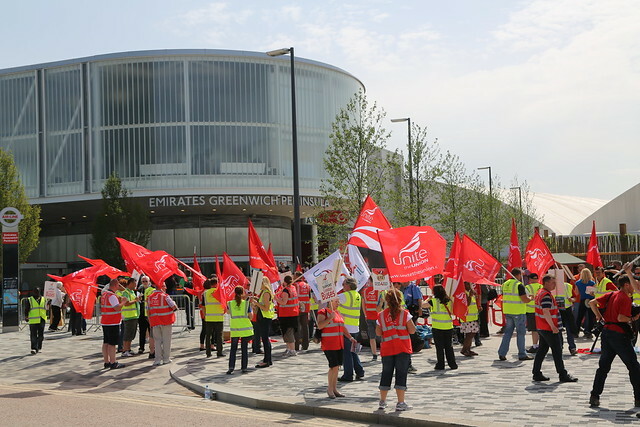 The service offers a quick new way to get from Greenwich to the EXCEL Arena, which is likely to bring tourists into east London and open up opportunities for people who work at either of the locations it serves. We also welcome the fact that Oyster will be accepted on the Airline and that frequent users will benefit from a reduced price." New mayor of Greenwich, David Grant, was one of the early passengers. Unite protestors tried to get their message across with lots of media in attendance. 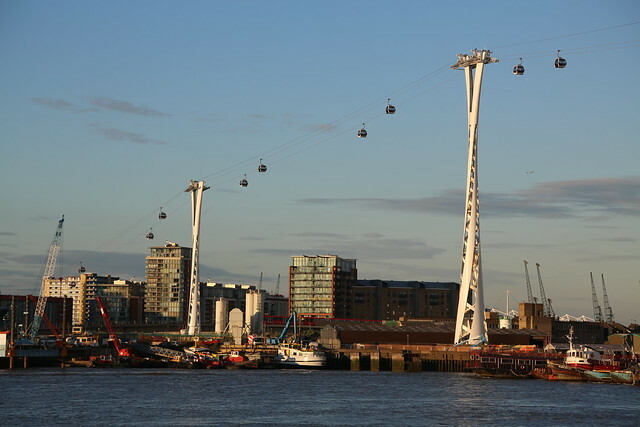 THE CABLE car across the Thames will open next week, it has been announced. 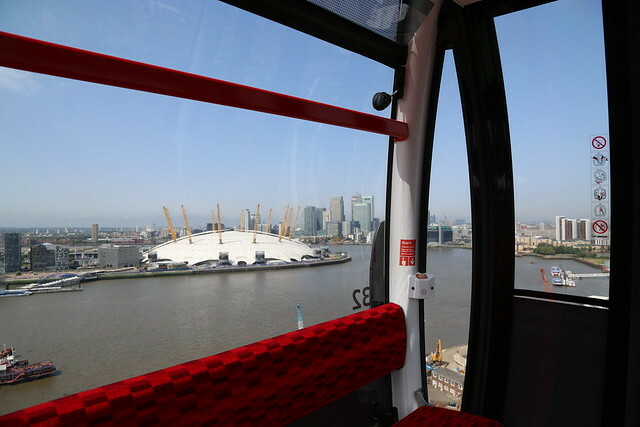 Passengers will be able to make the journey from Greenwich to the Royal Docks when the Emirates Air Line officially opens at midday on Thursday June 28th. A single journey for adult Oyster card users will cost £3.20 with children between 5 and 15 paying £1.60. Children under 5 will travel for free in the gondolas, each of which can fit up to two bikes in. Travelcard and Freedom card users will pay as the same as Oyster Pay As You Go users but frequent flyers can buy ten trips on the cable for £16. Journeys across the river will be available up until nine o'clock seven days a week although hours will be extended when events take place nearby. Construction of the £60 million cable car started last summer and contractors Mace have raced to complete it before London 2012. 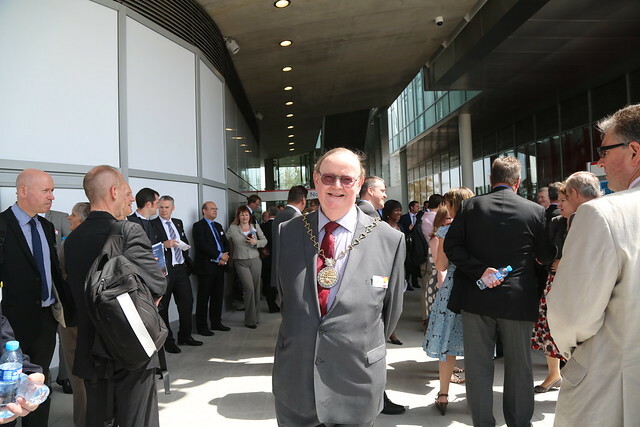 Peter Hendy CBE, London's Transport Commissioner, said: 'Passengers will very soon get to experience this unique and exciting new addition to London's transport network." Photo of the northern side of the Emirates Air Line cable car, taken from next to North Greenwich pier on Saturday evening. The Emirates Airline cable car took a step closer to completion yesterday as moving cable car gondolas were sighted for the first time. These pictures were taken today for Greenwich.co.uk by Daren when more test runs were being carried out using one full gondola and two skeleton gondolas. Here's a video that was posted to YouTube by user 'wye001'. ... you should be able to cross this spot of the river using the Emirates Air Line cable car. Thanks to Gordon Coster for the photo he took a few weeks ago. 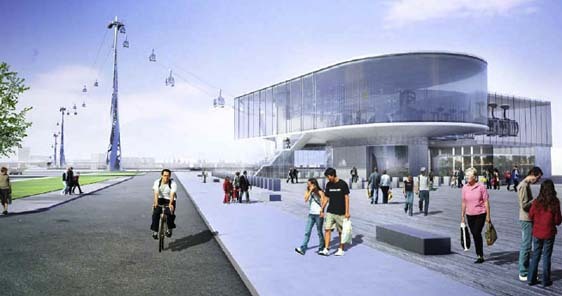 The government's advisor on architecture, CABE, has welcomed the proposed cable car link between North Greenwich and the Royal Docks. Their review of the scheme applauds "the elegance, inventiveness and originality" of the towers that will straddle the Thames, suggesting they will make an "iconic contribution" to this stretch of the river. The designs for the stations are described as "less inspiring" and "lacking the ambition" of the towers, although the report notes that the "the south station seems well located, on the axis of the new Greenwich master plan." The review says that the crossing may "become a major visitor attraction" as well as needing to cope with a surge of users following events at the O2 and ExCel and so space will be required to accommodate "large numbers of visitors" and more consideration needs to be given to "passenger marshalling and control". WCs should be installed at the stations, CABE says, and if the stations become a place to "meet and linger" rather than just pass through, as they believe is likely, there might might be a "greater demand for cafes, restaurants and other facilities surrounding these stations than is currently predicted." Planning applications for the scheme have been lodged with Greenwich and Newham councils.